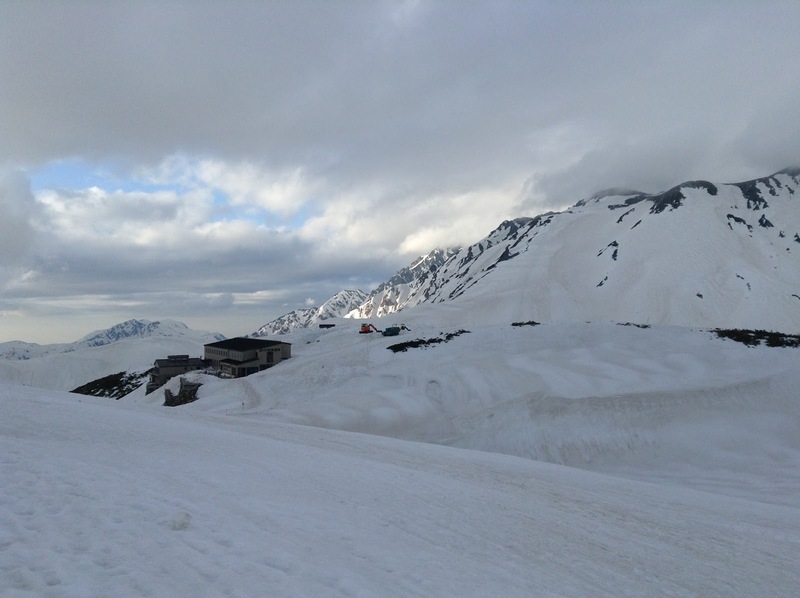 We did an overnight trip to Tateyama Kurobe Alpine Route 立山黒部アルペンルート, staying on top of the mountain at Murodo 室堂. During Golden Week, we took the 9:20 am bus from Shirakawago, getting to Toyama right on time at 10:40 am, no traffic at all unlike the ride from Nagoya to Shirakawago. Foreign passport holders can go to JR and get a ticket good for the 8 to 9 types transport necessary to get you from Toyama to Nagano for 9000 yen, which is good for 5 days. 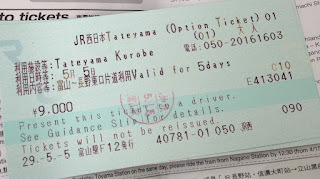 Residents can get a similar ticket from Toyama 富山 to Ogizawa 扇沢 at Dentetsu for 9490 yen, also good for 5 days. We had to reserve the time at Dentetsu Toyama for the first cable car leaving from Tateyama Station - not sure if this was because of the crowds during Golden Week. None of the other types of transport seems to require special reservation, except if you get off the bus at Midagahara and want to catch the next bus onward. Midagahara 弥陀ヶ原 during Golden Week Access to Shomyo Falls, the tallest waterfall in Japan, was not available so we headed for Midagahara 弥陀ヶ原 expecting to do a little hike along the boardwalk. On the way, the bus stopped for a few seconds where Shomyo Falls were visible. 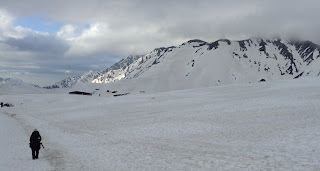 Little did we know, even in early May when only a thin long sleeve was needed, the area was completely covered in snow, no boardwalk to be seen - we later learnt that it usually opens in June. There were some free volunteer guides by the bus stop who took us to the Tateyama Caldera Viewpoint, which was very beautiful despite having to walk in snow for 30 minutes. We even did a little "sledding" by sitting on plastic bags! Walking to Raichoso was no joke! 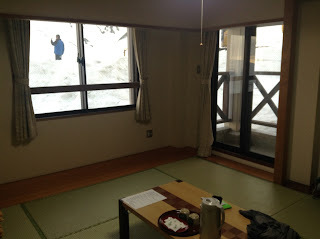 20 more minutes on the bus took us to Murodo 室堂, where there was even more snow... so with photo breaks, it took us about 45 minutes to walk from Murodo Bus Station to Raichoso 雷鳥荘, the mountain lodge where we were staying. If you're planning to do the same, make sure you have waterproof boots and warm clothes (winter jacket) even if it's t-shirt weather at Tateyama Station! It was a bit challenging to get to the lodge in the slushy snow but with breathtaking views of dramatic mountains!! None of the ponds were visible, of course. Near the entrance, there was a lot of volcanic gas but we couldn't really smell it inside. 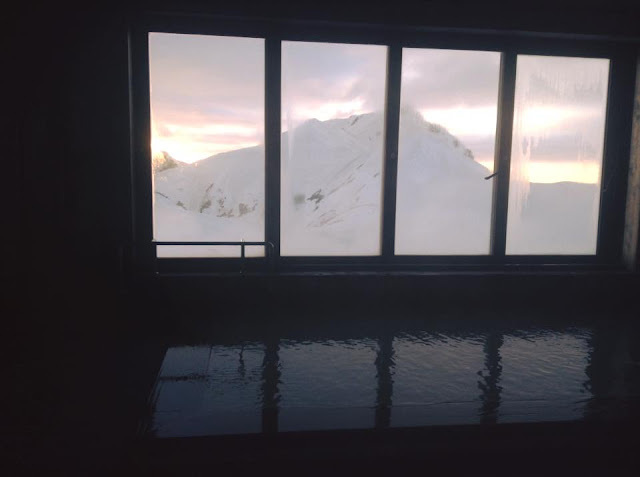 There's a drying room for wet boots and a milky white wooden hot spring bath overlooking the mountains-you can see peaks within reach as well as white smoke coming out of what looks like the crater!!! It was absolutely incredible - they close it for cleaning at 7 am so do not miss!! The food was surprisingly good and even though the halls are dated, the tatami rooms are quite new and nice, especially the corner room which is a bit bigger with a little balcony!! Shared bathroom and free wifi for the area! Only a small typical onsen towel is provided so bring your own. Bring meds as some of us got headaches maybe because of the altitude/gas. Also hay fever is alive and well even up here. That white smoke by Raichoso = volcanic gas! On the second day, it was raining － a small blizzard to be exact. It was a nightmare getting back as the two of us without waterproof gear got drenched and on the way back, we saw nothing... with the exception of souvenir shops. Luckily, the lines weren't too bad. 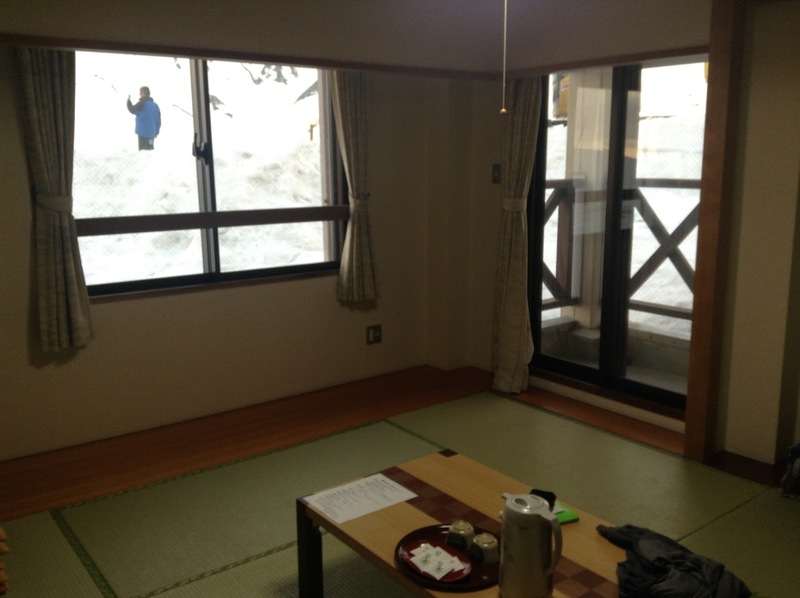 We took the bus from Ogizawa 扇沢 to Shinano-Omachi 信濃大町 before boarding a train for Kamishiro, near Hotel Abest Hakuba Resort ホテルアベスト白馬リゾート where we were staying. It's basically one local train towards Hakuba 白馬, getting off at Kamishiro Station 神城駅 plus a short 800-yen taxi ride (station has taxi phone number) or a 20 minute walk. Hotel is by a small river/waterfall with some cherry blossom trees which could be seen from our room. Barely anyone here at this time of the year even on a Saturday during Golden Week. We got a nice new spacious room with 5 single beds in 2 separate rooms (each with a door) plus an ensuite bathroom and extra washrooms in the hall. 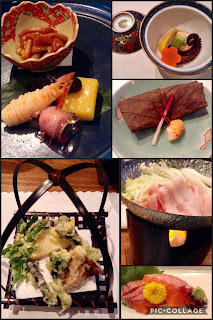 Exquisite course meal with local ingredients included in the reasonable price was very classy and beautifully presented on top of being delicious, even topping food at decent ryokans. 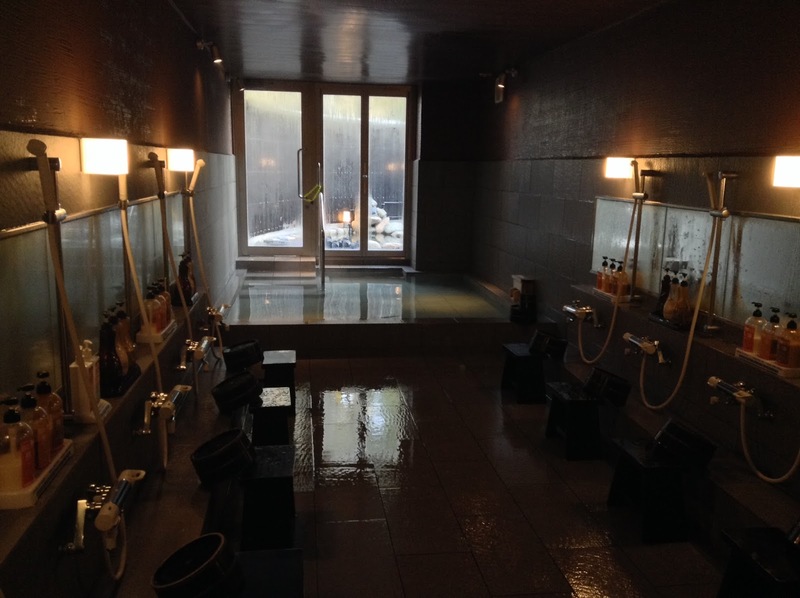 Outdoor onsen was closed but the indoor one was still nice with lots of amenities-one side has a sauna and porcelain bath & the sides for men/women switch early in the morning. Wifi works. Very infrequent trains back towards Matsumoto so definitely check the schedule beforehand!